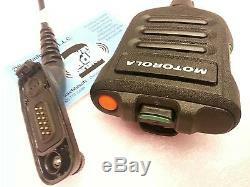 New OEM Impres XP Motorola Remote Speaker Mic! Nice Thin Ergonomic feel and Design! Built Solid and Superior sound!!! 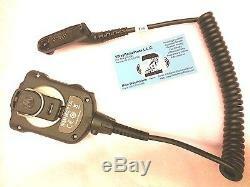 IMPRES XP RSM FOR APX W/ DUAL MIC NOISE SUPPRESSION. 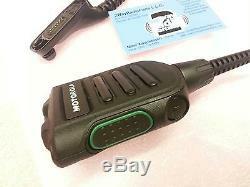 Will Work with MotoTRBO XPR7550 (latest firmware of R02.40.02 or better is required) series radios. XPR6000 series radios are NOT supported. Also Fully Compatible with APX 7000, APX 7000XE, APX 6000, APX 6000, XE, Li, APX4000, APX2000, SRX2200 Series radios. IMPRES RSM with Dual M.
Ic Noise Suppression, Volume Control, 1-Programmable Button and Orange Button. This Remote Speaker Microphone with it's thin design and optimized ergonomics is ideal for police officers and other public safety users. With Dual Mic Noise Suppression, you will be heard despite traffic noise and sirens in the background. When it gets dirty, just wash the microphone head to ensure your communication is not compromised. 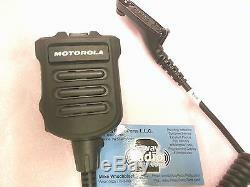 At 2WayRadioParts - We carry a full line of all Motorola Original Parts! The item "Motorola APX7000 APX6000 XE XPR7550 Impres XP Remote Speaker Dual Mic Thin Black" is in sale since Sunday, March 1, 2015. This item is in the category "Business & Industrial\Facility Maintenance & Safety\Surveillance & Alarm Equipment\Two-Way Radios".